Red Ponzi's Winning The Corporate Debt Race With The U.S. The US corporate debt of $15 trillion pales compared to China’s corporate debt of $19.7 trillion. From 2006 to 2018, total outstanding U.S. student loans surged over 200% from $521 billion to $1.57 trillion. Broken Trend Lines - Attention Needs Be Paid! Sure enough, the Dow fell 296 points or 1.2% on Friday, while the S&P 500 fell 1.7%, which confirms the technical breakdown under the important trendline that formed in early 2016. Thanks to the President Trump's policies, there has been a buyback explosion as illustrated by this chart which shows the dollar value of share repurchase announcements, by year. Sometimes one chart can say it all. Instead of trying to strong-arm trading partners into better “deals,” Trump should be creating an environment for the re-industrialization of the economy. The first step in such a policy must start with savings which is the key to economic growth. Today, we may have found the dynamo that drove purchases to a plateau of between 17 and 18 million units over the past three years: pervasive dealer discounts and incentives. Neither the fact that China’s bank balance sheets amount to more than 600% of GDP nor the fact that they have doubled in terms of percentage of GDP in the past several years suggests a healthy development. In today's chart of the day, view how the junk bond yield premium is at a three year low. Most of the 90 minutes last night was a waste—with both candidates lobbing well-worn clichés, slogans and sound bites at the audience and each other. But there was one brief moment that made it all worthwhile. David Stockman features an eye-popping chart that highlights a solution to prison overcrowding and saving taxpayer money. Bill Kristol is the epitome of the neocon mindset: cultivating a staid and urbane image while writing the most unhinged and mendacious claptrap. Description: The Great Deformation is a searing look at Washington’s craven response to the recent myriad of financial crises and fiscal cliffs. It counters conventional wisdom with an eighty-year revisionist history of how the American state—especially the Federal Reserve—has fallen prey to the politics of crony capitalism and the ideologies of fiscal stimulus, monetary central planning, and financial bailouts. These forces have left the public sector teetering on the edge of political dysfunction and fiscal collapse and have caused America’s private enterprise foundation to morph into a speculative casino that swindles the masses and enriches the few. Description: As Director of the Office of Management and Budget in the early 1980s, David Stockman was a chief architect of the Reagan Revolution—a bold plan to cut taxes and reduce the scope and cost of government. The Triumph of Politics was Stockman’s frontline report of the miscalculations, manipulations, and political intrigues that led to its failure. A major publishing event and New York Times bestseller in its day, The Triumph of Politics is still startling relevant to the conduct of Washington politics today. 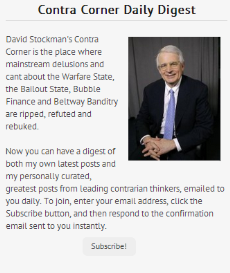 Description: David Stockman's Contra Corner is the place where mainstream delusions and cant about the Warfare State, the Bailout State, Bubble Finance and Beltway Banditry are ripped, refuted and rebuked.